Designed for DVD fans to rip, convert, copy or create DVD movies, mediAvatar DVD Suite packs DVD Converter Pro, DVD Copy and Video to DVD Converter together with a low price. To protect your DVD movie discs, you can either backup them as a digital copy on your hard disk by ripping DVDs to popular video/audio formats (AVI, MPEG, WMV, DivX, MP4, H.264/MPEG-4 AVC, RM, MOV, XviD, 3GP, MP3, WMA, WAV, RA, M4A, AAC, AC3, OGG...) using DVD Converter Pro, or copy your DVD movies to news discs, or to ISO image or DVD folder on your hard disk using DVD Copy. And the Video to DVD Converter in this DVD Suite can create your own DVD movies from lots of video formats (M2TS, MTS, TS, MP4, MKV, AVI, MPEG, DivX, XviD, MOV, QT, WMV, H.264/AVC, FLV, 3GP, etc. ) with custom DVD menu and video effects. All your DVD ripping, copying and creating solutions are in this pack! Rip and convert DVD movies to all popular video formats including AVI, MPEG, WMV, DivX, MP4, H.264/MPEG-4 AVC, RM, MOV, XviD, 3GP, etc. 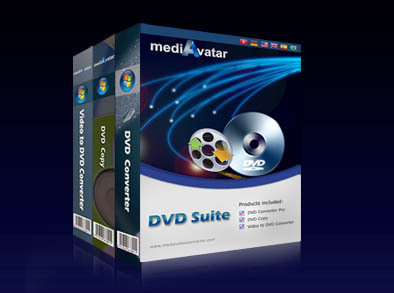 mediAvatar DVD Suite is comprised of DVD ripping, DVD copying, DVD creating, DVD burning software to satisfy almost all DVD software requirements. How to create DVD movies from video files with Video to DVD Converter? Clip as many segments as you want in any length freely from video or DVD title, and crop video frame size to remove borders you dislike before ripping or creating DVD. Add or adjust subtitle/soundtrack files to video and attach text or image as video watermarks before ripping or creating DVD; and choose subtitles and soundtracks you want for the target DVD before you copy DVD movie disc. Merge DVD titles/chapters and insert transitional effects in between to rip them to a single video. Make your own DVD menu by choosing from lots of menu templates, customizing menu topic, and background music/picture before creating your own DVD; choose to include/display DVD menu before copying DVD. IN DVD Copy, you have the options to copy full disc, or just main movie or selected titles to new disc, ISO or DVD folder; In DVD Converter, you can choose to rip certain DVD titles/chapters with selected soundtrack and subtitle; And in DVD Creator, you can adjust lots of video/audio paramerters, choose to add chapters or not. For more options in each DVD software, you'd better to have a free try. All the operations in DVD Copy, DVD Converter and Video to DVD Converter are designed to be easy to handle and can be completed in high speed.